Looking back now it seems quite some time since the return of the lapwings and curlews followed around mid-April by the swallows that nest in our barn. Now that we’ve reached the first week of May I look at the results of my early seed sowing with a slight air of disappointment. A hard lesson has been learned yet again about planting too soon. This time around I waited a little longer before planting but didn’t make any allowance for our new location after moving much further inland and 1000ft above sea level. I can take the blame for the timing perhaps but it’s too soon to apportion blame for the poor germination rate for seeds sown indoors. Depending on the results of the more recent sowings I’ll know soon enough whether it’s the seeds or the sower. 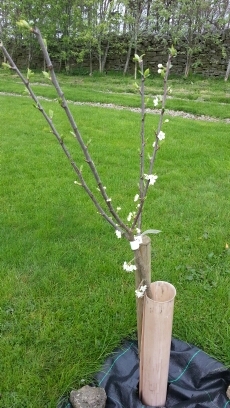 On the up side the 5 fruit trees (plum, pear and 3 apple) all seem to be coming to life so my first attempts at tree planting were successful. Hopefully they haven’t suffered any ill effects after spending some time in standing water due to the heavy rain over the winter. 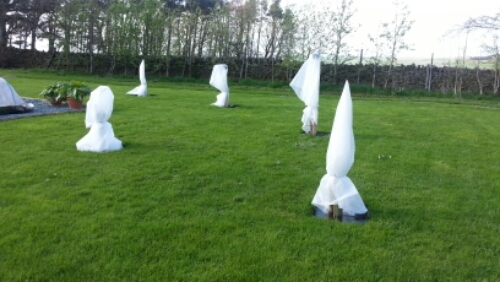 Although the weather has been fairly mild since the start of the year we still got a frost at the start of May so it was lucky that I had a roll of horticultural fleece stashed away. I have been pleasantly surprised to see the Victoria plum is already flowering very nicely – I hadn’t quite expected to see flowers so early in the year. Obviously I need to read up a bit more on all the fruit trees so I can make sure they get a good start in life in their first full year here. 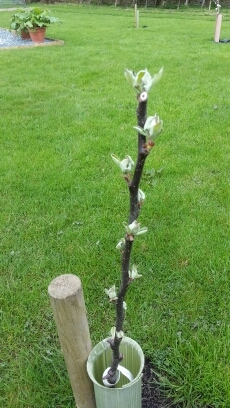 The pear and 3 apple trees are much slower to get started but within the last few weeks all are making a start on leaf growth.